In addition to our comprehensive graphic and GIU (interface) design services we offer a fantastic web application development service. Using Microsoft ASP, SQL, XML and .NET technologies, we have created online applications, quotation systems, CMS (Content Management Systems), Ecommerce and B2B commerce systems that provide added value to any web presence. 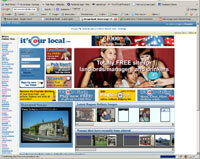 Click on a thumbnail to view the web design & development project. An extensive product e-commerce site (currently not active for sales) with large back-end management system. (Recently adapted to be responsive). A massive project involving a "Facebook" style site for pub goers and pub, bar, hotel and restaurant managers. "You have done a very fast and excellent job with it."